A new artwork has been unveiled in Southwark this week. 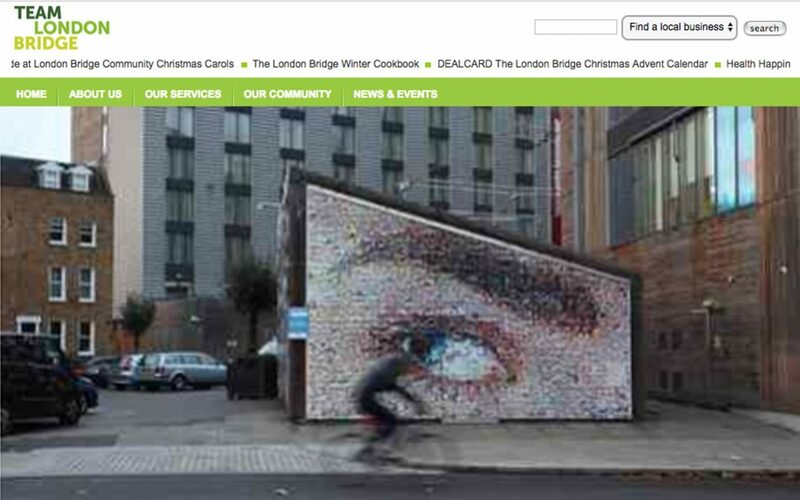 ‘The Eye On The Road’ takes pride of place at the back of Bermondsey Square overlooking Tower Bridge Road and is the work of esteemed digital artist, Helen Marshall of the People’s Picture. The giant photo mural is made up of 1,955 images reflecting the local history and present day activities in and around Tower Bridge Road. The eye itself is of the artist’s daughter and acts as a signature for her work. The piece was jointly commissioned by Southwark Council and the local business association, the Tower Bridge Road Alliance, as part of a council initiative to boost local highstreets. Local businesses successfully applied for funding from the council’s High Street Challenge scheme before tendering for an artist. Helen Marshall, whose work includes “Face of World War One” which was commissioned by BBC World War One and an image of the Queen in commemoration of the monarch’s Jubilee celebration at Gatwick Airport, worked collaboratively with the Southwark local history service and local photographers to collate images reflecting the local history and present day activities in and around Tower Bridge Road. Artist Helen Marshall, said: “It was a refreshing challenge working on this commission as it is my first street artwork and I think the location will capture the attention of many passers by. The artwork was composed of many photographs, in particular those of portraits of people who live and work in the area. These present day portraits are juxtaposed with faces of history, kindly gathered and lent by Southwark Council’s heritage department.